Also this year TECNECO participates in Autopromotec 2019 scheduled in Bologna from May 22nd to 26th, with a new stand, completely redesigned and wider than in previous editions. Moreover, like every time at this fair, this year the company will also present an important innovation: the oil filter program for automatic transmissions. A range of 50 codes, to start with, covering the main and most recent applications. Nice experience with the little friends of the 2a Media of the Istituto Comprensivo Statale di Alezio (LE), who came to visit us together with their teachers, curious to understand how a company that works works. It was a pleasure for us to answer their many questions, and to see how curious and awake children of their age can be. NEW PARTNERSHIP IN CAMPANIA WITH D.E.R. New partnership in Campania with D.E.R. distributor that has made its way in recent years thanks to a smart company structure and a commercial policy based on service and on the direct relationship with the Customer. We will be present at the next edition of the AUTOPROMOTEC fair, in Bologna, from May 2th to 26th, 2019. If you are around there, come and visit us -> HALL 18 - STAND B30. Thanks for the attention. TECNECO once again classified by TECALLIANCE certified supplier of CLASS "A" data. Disponibile una nuova funzione su e-commerce TECNECO, attraverso il tasto verde AGGIUNGI AL TUO ORDINE, posizionato in alto a sinistra sul portale, avrai la possibilità di aggiungere al tuo rdine in corso altri articoli fino a prima della spedizione. We will be present at the next edition of the MOTORTEC AUTOMECHANICA MADRID fair, in Madrid, Spain, from March 13th to 16th, 2019. If you are around there, come and visit us -> HALL 5 - STAND 5F02A. Thanks for the attention. We believe today more than ever in the importance of the right technical information directed to the Installer. For this reason, with the help of our Customers, we have decided to create a database with the e-mail addresses of their Customers, to send technical reports and product updates directly. We are confident that this service will improve relations and collaboration between Manufacturer, Dealer and Installer. In January and February 2019 two new advertising pages dedicated to TECNECO and NISHIBORU products in the trade magazines Il Giornale dell'Aftermarket and Il Giornale del Meccanico. The first, on the Giornale dell'Aftermarket, is dedicated to the NISHIBORU brand, to present to the operators the new brand specifically for Asian cars filtration. The advertising page dedicated to TECNECO brand, published in the Giornale del Meccanico, has instead a more technical cut and draws attention to the quality of the filters produced, guaranteed by hundreds of laboratory tests and continuous on-line checks. With TECNECO you can choose from a complete range of filters for all types of vehicles, with original quality, in compliance with the standards required by car manufacturers and in compliance with EC law 461/2010. Simple, immediate and secure warranty, means that any damage caused by a defect or malfunction of a TECNECO filter, will be refunded immediately, once is established the responsibility in the hands of the manufacturer. After a year of work together our friend from 3d0 we are ready with the "Commercial Statistics Module" to have all the necessary numbers at hand and in real time to improve the service to customers and our sales performance. MICKS GARAGE, one of the first online auto parts sales sites in Ireland, invest on TECNECO to strengthen its filtration offer. Our partnership with the Dublin company began last year and for 2019 relations are expected to intensify. The Irish operator believes on our range and intends to strengthen the TECNECO offer to its Customers to better operate in a market, the on-line one, already highly developed in Ireland. From March 2018 the TECNECO product range has been expanded with the introduction of a new brand: NISHIBORU FILTERS. The new brand was created with the precise objective of specializing and further enhancing the filtration program dedicated to the Asian cars set up by the Lecce factory. "The NISHIBORU project - highlights Luca Pino, Tecneco's sales and marketing manager - will allow us, over time, to offer the market a specific, complete and continuously updated program, composed of over 400 product codes divided between air filters, oil filters, fuel filters and cabin air filters". Here is the new video NISHIBORU, entirely dedicated to the new brand specialized in filtration for Asian applications. The NISHIBORU product range has already been presented a few months ago, now we are getting more and more into the heart of this new project on which we are aiming a lot and we are constantly strengthening. As per tradition even this year, on INFORICAMBI, an interesting article by Stefano Belfiore that summarizes the 2018 trend of the Italian Aftermarket, thanks to the contribution of some companies, including us, have a good reading. Today TECNECO gas filters program is extended with 2 new product codes, below direct link to full program. Friday 07/12/2018, it was a pleasure to have as visitors a small but "great" delegation of the Assoricambi Consortium at our facilities. A good opportunity to compare, share and strengthen a collaboration started three years ago and that goes on strengthening year by year. Finally, we have started work on the construction of the new TECNECO air filter production plant, which will be followed by the complete renovation of the current plant, which will be transformed into a new centralized warehouse of over 5.000 square meters. NOTIZIARIO MOTORISTICO - "TECNECO DISTRIBUISCE I FILTRI NISHIBORU"
On NOTIZIARIO MOTORISTICO is talking about NISHIBORU. Già dallo scorso anno, lo specialista della filtrazione Tecneco è importatore e distributore ufficiale per l’Europa del brand asiatico Nishiboru, marchio che potenzia ulteriormente il programma filtrazione per vetture asiatiche dell’azienda leccese. Per Tecneco, infatti, Nishiboru rappresenta “la combinazione ideale tra performance di filtrazione ed affidabilità”. The events organized by AUTOMILOVANOVIC, the official TECNECO distributor for Bosnia Herzegovina, continue. This time we are in Sarajevo, capital of Bosnia and Herzegovina, where for two days 29 and 30 September, the first edition of the MINI HOME FAIR was held. Dedicated to all customers and organized in collaboration with all suppliers. Sarajevo follows the other mini home fair organized by Automilovanovic in the various areas served, according to the successful format of the traditional annual home fair of Banja Luka in Bosnia. On INFORICAMBI an interesting article by Stefano Belfiore on the participation of TECNECO at AUTOMECHANIKA Frankfurt 2018. "Automechanika Frankfurt has always been one of the most important international trade fairs for us, and a large part of our network of export customers was created during the many editions of the fair, which took place over the years, and which we have participated since 1988. Today this event remains our bridge to export, both in terms of new contacts and meeting with our historical customers." "La forza di un’azienda è nella sua evoluzione al passo con i tempi. Lo sa bene TECNECO. La factory Leccese, operante nella progettazione, produzione e commercializzazione di filtri aria, filtri olio, filtri carburante e filtri abitacolo per automobili, veicoli commerciali leggeri, mezzi agricoli e industriali, oggi si dota di una nuova organizzazione aziendale: TECNECO FILTRATION. Struttura orientata a rafforzare ulteriormente e prima di tutto la sua presenza nell’aftermarket indipendente e poi nel comparto industrial. TECNECO pianifica così, da buona impresa che si rispetti, la sua crescita, mettendo a fuoco 3 specifiche aree di attività : TECNECO (The Independent Filters Factory): il brand con cui distribuire nell'IAM Italia e mondiale il programma filtrazione per applicazioni Europee. NISHIBORU (The right choice for Asian applications): il marchio che ha la precisa mission di distribuire nel post-vendita internazionale il programma filtrazione per applicazioni Asiatiche. Ed ancora SPECIFIC FILTRATION (Your partner in filtration): il nome del programma con cui TECNECO gestisce la progettazione, lo sviluppo e la produzione conto terzi, affiancando importanti gruppi industriali operanti nel primo impianto automobilistico, nel ricambio originale nonché nella produzione di motori per molteplici applicazioni, nella filtrazione industriale. Tutto questo sotto il nome TECNECO FILTRATION:“Perché la filtrazione - fanno sapere dall’azienda - è il nostro settore e ci piace esplorarne sempre nuovi orizzonti”. Thanks to Simone Lo Prieno from RICAMBI D’AUTO BustoArsizio (VA) Friday 15/06 we held a nice technical focus on our products together with a 70 Mechanics. Everything was organized in a way but 5 minutes before the start a technical problem did not allow us to project slides and videos of the presentation. After the first moments of panic we went ahead and products in hand we started to talk directly with the guests who turned out to be very participatory and attentive. In our small way, we have transformed a crisis into change and perhaps discovered a new way to conduct a presentation of our products, mixing technology and direct participation. We are glad to share with you a very interesting report on TECNECO, online today on INFORICAMBI, below the direct link. "TECNECO is all-in-one. The Lecce factory, operating in the design, production and marketing of air filters, oil filters, fuel filters and cabin filters, for light commercial vehicles, agricultural and industrial vehicles, brings together in a single catalog the filter program for agricultural and industrial applications developed during the years. PROFILT (Professional Filtration) is the name of the project thanks to which, from now, Tecneco will begin to propose and increase its range of filters for industrial applications. The catalog includes air filters, oil filters, fuel filters with applications on tractors, compressors, earth-moving machines, and many other professional vehicles. Each filter shown in this catalog is made with the use of compliant and specific materials. All in compliance with the standards and filtration performance required by parent companies. Numerous product codes contained in this catalog are supplied by Tecneco directly to the manufacturers, as original equipment (OEM) and/or original spare parts (OES)." 17/05/18, a nice evening of technical in-depth analysis together with our friends of BM Ricambi di Montebelluna (TV) to talk together about filtration, technology and market. Thanks to Daniele and Alessandro and all the Mechanics come. Ciack we are ready, because being manufacturers today is important and in the long run makes the difference, so we thought well to let you know with a nice video, soon in the best cinemas, realized thanks to the partnership with Fabrizio Cirfiera, young photographer and videomacker Salentino from Boma Visual. Also this year a nice party with friends of DEAR Srl, TECNECO dealer of Orio al Serio (BG). Over 450 participants among mechanics, experts of various kinds and curious, really lots of beautiful people, fun, training and salami for everyone, a consolidated and proven success that is repeated every year. "TECNECO introduces a new verification system for fuel filters.The Lecce specialist, working in the design, production and marketing of air filters, oil filters, fuel filters and cabin filters for cars, light commercial vehicles, agricultural and industrial vehicles, conceives a intelligent testing system designed for air tightness tests with load loss detection using ATEQ instrumentation and for tests of operation and measurement of electrical parameters relating to filter resistance thermometers (temperature sensor, pressure sensor, water detection sensor) and inrush current limit sensor). " 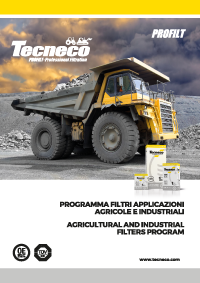 With this catalog we have grouped all TECNECO filter program for agricultural and industrial applications developed over the years. The catalog includes air filters, oil filters, fuel filters with applications on tractors, compressors, earth-moving machines, and many other professional vehicles. Each filter shown in this catalog is manufactured with compliant and specific materials and in compliance with standards and filtration performance required by vehicle manufacturers. Numerous product codes conteined in this catalog are supplied by TECNECO directly to the manufacturers, as products of Original Equipment (OEM) and Original Replacement (OES). The new TECNECO 2018 FILTRATION KIT program is available with a total of 72 Kit codes and 22 new Kit 2018 codes. The 72 Kit codes grouped in this catalog are only a representative sample of the most revised Kits in relation to the most popular cars in the Italian car fleet. On www.tecneco.com/p/kit_filtri.htm an easily available online catalog is available, where we provide all the Filtration Kits available in the TECNECO range. We inform you with pleasure that starting from this month of March 2018 our product range is extended with the introduction of a new brand called NISHIBORU FILTERS. This new brand, which we import directly and exclusively for all of Europe, will help us to further enhance and specialize our filtration program for Asian cars. We are counting on getting a full products with this new product line within a year from now, so during this transition period, the NISHIBORU program codes will be available as TECNECO and replaced by NISHIBORU gradually. To facilitate the transition from one brand to another, we thought well not to change the product code, which will remain the same today available as TECNECO. Moreover all the filters available under the NISHIBORU brand will always be contained and managed by the TECNECO online catalog simply indicated as (Supplied as NISHIBORU). At the end of the transition the result will be that we’ll being able to manage with you a new specific brand, complete and continuously updated, for the filtration (air, oil, fuel and cabin) dedicated to the Asian cars. for further information, kind regards. New journey in Eastern Europe x our Export Manager Francesca, this time in Poland where Pawel Zulawnik of Kolpax, TECNECO distributor, was waiting for her. Pawel is the son of a dear friend Andrzej Żuławnik who left us a few months ago and thank him for the excellent work done in all these years to promote and distribute our products in a so difficult market like the Polish one. 26/02/18, we would like to thank Assoricambi for inviting us to attend the 2018 shareholders' meeting at Hotel Barcelò Milan, a great event organized in perfect style ASSORICAMBI. Congratulations to everyone. Since 2002 we cooperate with Bulgarian company AUTOHIT for distribution of our products in Bulgaria. A lot of years during which our two companies are together, consolidating a renewed partnership year by year. Today, AUTOHIT is one of the three largest auto parts distributors in Bulgaria, with a hub of over 7.000 square meters in Ruse, in the north of the country, and 30 branches throughout the country, only 6 in Sofia, the capital. Together with Zlatan and Milen, the mind and soul of AUTOHIT, today we have archived an excellent 2017, and plan the new strategies for 2018 which seems to be a very interesting year. Francesca our Export Manager visiting ELTREKKA, one of the largest and most organized auto parts distributors in Greece, official TECNECO distributor. A whole day together with Kyriakos Soulioutis and Dimitris Gollias, respectively Mktg and Product Manager, to discuss and plan strategies for 2018, in a market like the Greek one still in crisis but with high growth potential for a brand like ours. Completed a new project, produced the air filter of the DUCATI MONSTER, developed together with an important European player in motorcycle spare parts. We hope it is only the first step of an interesting and stimulating collaboration, the conditions are all there and we will do our best to this is it. Introduced new function on TECNECO E-commerce, the "Quick Order". Through a quick order filling system, it is now possible to load your cart in a massive way, by entering all the codes that interest you in a single screen. In Stefano Belfiore's article "A beautiful the Christmas of spare parts" on Inforicambi, Players of the Aftermarket market draw conclusions on the performance of the year ... including TECNECO. What is the budget for this year? Happy new year growing in 2 figures both in Italy and abroad, inclusion of over 80 new product codes, numerous meetings held in the company for a total of over 300 workers, spare parts dealers / mechanics visiting our partners. factories. Launch of positive e-commerce with increased orders, new customers in open areas, excellent response from new contacts after Autopromotec Bologna. Projects and results for 2018? We want to upgrade the ADPlus range of antibacterial cabin air filters and NISHIBORU filters for Asian applications. We also intend to completely reorganize the internal logistics with a new warehouse and upgrade the production of engine and cabin air filters with a new production plant. Finally, we have programmed over 140 new product codes, the launch of the new TECNECO pachaging, while strengthening our presence on foreign markets. Thanks to everyone who trusted us as partners. We are ready to do all our best for the next 2018 coming. After the new TECNECO logo launched in 2017, starting from January 2018 we will also launch the new packaging, completely redesigned in graphics and colors. The operation was necessary to integrate the new logo into the graphics of our boxes. The new packaging, essential and colored at the same time, has as its dominant color the white, as before, with combined the classic yellow TECNECO and the gray in two different shades, lighter and darker. Also redesigned the back of the box, with more and more space dedicated to the communication of technical characteristics and product performance. 283 new codes developed in 3 years: 109 in 2015, 87 in 2016 and 87 others designed this year. TECNECO travels at full speed on the filtration track. The Lecce specialist, operating in the design, production and marketing of air filters, oil filters, fuel filters and cabin filters for automobiles, light commercial vehicles, agricultural and industrial vehicles, increasingly plays the role of attentive player in the after-sales sector, expanding the range of solutions at the right time and inserting very recent applications. On this front, there are new changes. Among these, the latest commercially most interesting development code is the OL2157E for the latest Euro6 engine applications - FIAT 1.3 MJT - OPEL 1.3 CDTI - CITROEN / PEUGEOT 1.3 BLUEHDI. On the other hand, the most technologically interesting and last conceived one concerns the GS2084E with high water / fuel separation filter media "HWS technology" and a further inner tube made of synthetic material with 2 micron porosity for further water / fuel separation. Both applications are destined for the latest Euro6 engines - OPEL 1.6 CDTI - CITROEN / PEUGEOT 1.6 BLUEHDI - FORD 1.6 TDCI. New episode of IR-News on INFORICAMBI.IT, online newsletter on the Independent Aftermarket sector with Vivien Russo. This episode also talks about TECNECO, with a particular focus on our ever expanding product range. volevamo informarla che è attiva sul nostro E-Commerce, una nuova funzione di importazione degli ordini tramite file csv ed excel (.xls). 1) Nella homepage dell'e-commerce sono presenti due nuovi pulsanti: Scarica modello e Carica Excel/Csv. Il primo permette di scaricare un modello dimostrativo in formato excel, all' interno del quale sono presenti 2 soli campi, COD. TECNECO e QTA', ed è in questo modo che devono essere strutturati i file da implementare. 2) Da "Carica Excel/Csv" si seleziona il file che si vuole caricare. 3) Cliccando poi su "Importa" si ottiene a video l' elenco dei prodotti importati. 4) ATTENZIONE: prima di procedere al caricamento del carrello, il sistema segnalerà eventuali "Errori dell'importazione del file" (es. : codici errati, quantità errate), che non saranno presenti nel su indicato elenco. 5) Infine, cliccando sul pulsante "Aggiungi tutti" i codici in questione verranno inseriti direttamente nel "Carrello" e si potrà procedere così all' invio dell' ordine. 17-18-19 November 2017, three days together with the friends of EMPORIO DELL'AUTO FIORENTINI, a group of 5 Warehouses between Lazio and Tuscany, with branches in Civitavecchia (RM), the historic site, Santa Marinella (RM), Tarquinia (VT), Grosseto (GR) Follonica (GR). We have had the pleasure and the honor to have with us the Group Patron, Pierluigi Fiorentini, who came with 10 of his Customers to visit our production plants and spend a pleasant weekend in Salento. With us, for three days, Cesare Curiel, our Sales Manager for Center Italy. 8 and 9 Nov 2017, a nice meeting at TECNECO plants with Sergey and Nona from VOSHOD Ltd and AUTO-RISE, future TECNECO distributors in Kaliningrad in Russia, in collaboration with SWISSVERT. Thursday October 26 2017, a nice evening with the friends of CRS Centro Ricambi Salmaso Thiene in the province of Vicenza. Together with about forty Customers we talked about TECNECO, our products and filtration in cars. An evening with lots of questions and a nice dinner at the end. Thanks to Luca, Stefano, Tommi and all the CRS team. A nice article by Stefano Belfiore about NISHIBORU on INFORICAMBI. "NISHIBORU è la combinazione ideale tra performance di filtrazione ed affidabilità. Lo ha capito Tecneco che, dallo scorso anno, è ufficialmente importatore e distributore ufficialeper l’Europa di questo importante brand. Marchio che potenzia e specializza ulteriormente il programma filtrazione per vetture asiatichedella factory leccese. Il primo endorsementpubblico è arrivato nell’ultima edizione diAutopromotec dove è stata presentata la neo gamma che ha riscosso un forte interesse da parte degli operatori dell’aftermarket." Another Customer Meeting in TECNECO, this time guests come close, Piero and Fabio Aloisio, from ALOISIO AUTORICAMBI Brindisi, visited us together with a large number of their Customers, last Friday, October 20, 2017. This time we started the works directly with the visit of factories, first the oil and fuel filters production plant and follow the air filters production plant. Our guests have all been very attentive and interested, there have been many questions and all aimed at understanding the functioning and quality of our products. The day ended in the beautiful town of Gallipoli, where we had a nice evening and ate the excellent fish. This event, for us at TECNECO, was very important, infact AUTORICAMBI ALOISIO is an important company in auto parts distribution, and is member of Consorzio ASSORICAMBI, one of the most important Consortiums in Italy, in which TECNECO has entered as official supplier in September of the last year. TECNECO WHEN THE SPARE PARTS IS AT "KM 0"
A nice article about us on the INFORICAMBI sector portal, very interesting and well written by Stefano Belfiore, summarizing our philosophy of work and product distribution. It was begining of 2017 when with Gintare and Egle, both sisters and owners of DETALITA, TECNECO official distributor for Lithuania, we decided to organize a promotion, to visit Italy and TECNECO plants, with the most affectionate customers of our brand. The promotion seems to have gone very well and the 11 October 11 Lithuanian friends are arrived in Italy to visit our plants. A great experience for everyone, guests have been interested in our production cycle, they have made many questions and understood that they may still have more confidence in the products. The growth prospects of our brand in Lithuania, thanks to the partnership with DETALITA, are important. For Egle and Gintare we can grow more and surely this initiative will help us. Guests have also enjoyed our climate, our beaches and our food and are already thinking to reorganize a new promotion for next year. September 22-24 2017 with Domenico Blandina from REV, a historic TECNECO dealer in Palermo, along with a large group of Customers, all for three days of relaxation at the Delfino Beach Hotel in Marsala. Since September 2017 TECNECO is officially in KROMEDA, another important spare parts database, increasingly used by car repairers, rebuilders and Long Term Rental Companies. With the entry into KROMEDA, TECNECO increases its presence in the world of spare parts databases, after joining TECDOC, INFORICAMBI, CLIPPARTS and MOTORPLAN. 14 September 2017, directly from Gianico (BS) to Collepasso (LE), Matteo e Simona Gritti, from FIRAT RICAMBI Srl, along with ten Customers, visiting the TECNECO factories. FIRAT RICAMBI Srl is an important spare parts dealer operating in Val Camonica (Brescia), who has been working with us for years and therefore decided to visit our company together with a large number of its Mechanical Clients using TECNECO products. 11 September 2017, directly from Vicenza (VI) to Collepasso (LE), Tommy Salmaso from SALMASO RICAMBI Srl - Gruppo BM, along with some twenty Customers, visiting the TECNECO factories. SALMASO RICAMBI Srl is an important spare parts dealer operating in Vicenza and province, a member of the BM Group, who has been working with us for years and therefore decided to visit our company together with a large number of its Mechanical Clients using TECNECO products. DETALITA, TECNECO official distributor in Lithuania, engaged in an interesting advertising commercial, on the most important television networks in the country. TECNECO increasingly in TecDoc, with the latest data update package, we are officially "CERTIFIED DATA SUPPLIER", a great acknowledgment considering that we have just entered in one of the most important automotive component databases in the world. In the last period, we have expanded our range of GAS Gpl and Methane filters and we have thought this well to publish a catalog/flyer that brings together the whole program, with images, dimensions, crossesand price lists. 01-02 September 2017, directly from Corigliano Calabro (CS) to Collepasso (LE), Davide Falbo from FALBO RICAMBI Srl along with 9 customers, visiting TECNECO factories. FALBO RICAMBI Srl is an ASSO RICAMBI associate which has decided to include TECNECO in its range of offer, therefore the intent to visit our company arises from the need to touch with hands and show to customers our production reality, transferring them trust and awareness that with TECNECO you can work well, with satisfaction and having fun. From Russia with passion, even this year TECNECO in Moscow for MIMS Automechanika 2017, the most important fair for car components in Russia and CIS countries. Once again with SWISSVERT, our trading partner for the Eastern Europe and Asia Continental markets. This year was an interesting edition for TECNECO with the strengthening on some countries such as Moldova, and opening up new markets, such as Russia and Kyrgyzstan. Summer Holidays are coming even this year, a little rest is good for everyone but do not warry we will not let you alone for a long time, below the dates. "It's a racing race for x and crew, our second and third class achievements are equally impressive because we have given everything we could to give this weekend! Congratulations to Giacomo Guglielmini and his faithful navigator Along with all the N3 class that proved to be competitive and to the hand!" Il Giornale del Meccanico July-August 2017, TECNECO is still present on the well-known magazines with an interesting adv on part of our team. 21-24 August 2017 MIMS AUTOMECHANIKA MOSCOW, TECNECO together with SWISSVERT to present our products during the most important car component exhibition in Russia. Even on June 2017 TECNECO is present on the famous specialized Italian magazines "Il Giornale del Meccanico" and "Il Giornale dell'Aftermarket", with an interesting adv on our company policy. "E’ l’unica barriera tra le polveri presenti su strada sollevate dalle auto che ci precedono e i nostri polmoni. Si tratta del filtro aria abitacolo: componente, pertanto, essenziale per tutelare la salute di chi è a bordo. Fronte su cui si cimentano con qualità diversi produttori nazionali. Un’importante novità, che fa rima con innovazione, arriva da Tecneco. L’impresa di Lecce, operante nel campo della filtrazione per automobili, veicoli commerciali leggeri, mezzi agricoli e industriali, ha infatti lanciato da poco in aftermarket una nuova gamma: l’ ADPlus." "Come per ogni intervista, estrapoliamo una delle frasi più significative. E quella fatta a Luca Pino non fa eccezione. Effettivamente di questi tempi in molti rincorrono le più disparate linee di prodotto, talvolta senza rispettare la storia del marchio o conoscere ciò che si propone alla clientela. Ma vuoi la crisi e vuoi la volontà di farsi strada nel marasma che è attualmente l'aftermarket, questa sembra essere la strada più "facile" da seguire. Invece altri intendono imporsi ulteriormente soprattutto in quei segmenti di mercato in cui è riconosciuta la loro professionalità e qualità." Has just come to the end the 54th International Swimming Championships Nuoto Sette Colli Roma. International event heldin the fantastic Stadio del Nuoto of Rome Foro Italico. Our Michele Malerba qualified for the two finals "A" of the 100 and 200 backs, placing respectively 6th and 7th absolute. Sunday June 25 2017, all on track at PISTA FLUIDA in San Salvo (CH) at KARTING DAY 2017 organized by CAR SERVICE AGNONE (IS), TECNECO dealer in Molise and Abruzzo. 80 Mechanics Molisani and Abruzzesi arechallenged in a real GP with qualifications, manches and final race. Saturday June 24 2017, we spent an amazing evening at Jesi (AN) guests of our friends and retailers ADRIATICA PARTS who have organized a real party with so much beer, wine, great food and lots of fun. Today we officially introduce ADPlus, the TECNECO antibacterial cabin filter program. We have developed 10 product codes now and will soon be available fo another 10 to arrive at about 60 codes a the end of 2017. TECNECO ADPlus antibacterial cabin filters are manufactured using a special multi-layer filter media Fiber/Active Carbon/Antimicrobial Fiber with 3 stages cabin air filtration, 1° captures polluting particles – 2° absorbs gases and odors – 3° prevents formation of bacteria. Specifically is the antimicrobial fiber biofunctional layer that added with natural polyphenols is catching the free allergens and deprives to bacteria and mold from food necessary for their proliferation, thus playing its antibacterial function. It is always a pleasure to have as guest our friend Filippo Girardi from EUROCAR Srl in our company. 15th and 16th June, Filippo cames to visit our plants together with a group of his Customers. As always in these occasions we spent an entire morning in the company, discussing about filtration, engines, market and then all in production, to see closely how we design, manufacture and controlTECNECO filters. Taking advantage of the beautiful season, in the afternoon, we moved to one of the most beautiful beaches of Gallipoli, Punta della Suina, where we spent an amazing afternoon and attended one of the most beautiful sunsets in Salento and then all at dinner in suggestive Old Gallipoli. The next day around the coast, up to Leuca, then we greeted our friends and fixed to meet again next year. INFORICAMBI.IT, here is the direct link to a beautiful editorial on TECNECO, about the latest edition AUTOPROMOTEC 2017. Proprio così. L’ampliamento della gamma, per quanto attiene il mercato asiatico, ci sta portando ad investire sempre più, allargando maggiormente questa gamma filtrante. La novità saliente sta nell’aver separato la gamma Tecneco da quella asiatica con il lancio di un nuovo brand NISHIBORU per il quale saremo importatore e distributore ufficiale per l’Europa. A breve contiamo di commercializzarlo su scala europea. 30 May 2017, for the second consecutive year TECNECO exceeds the strict quality audit for the supply of oil filters by ROTAX, an important Austrian manufacturer of motors for multiple sports applications such as aircraft, motorcycles, karts, jet skis and more. May 2017 TECNECO is also present on the famous specialized Italian magazines "Il Giornale del Meccanico" and "Il Giornale dell'Aftermarket", with an institutional adv on our products. 21 May 2017, Leskovac - Serbia, is the third edition of LUKENA AUTO Home Fair 2017, an annual event organized by our trading partner in Serbia. A special thanks to Tomislav and Ivana who are so committed to promoting the brand TECNECO and its products in Serbia. Ancora una volta Tecneco sorprende in positivo il settore della filtrazione, declinata nell’aftermarket indipendente, con soluzioni attente alla qualità/performance ma anche alla salute degli automobilisti. Importanti novità di gamma che la company di Lecce, con alle spalle più di 40 anni di esperienza nella progettazione, produzione e commercializzazione di filtri aria, filtri olio, filtri carburante e filtri abitacolo per automobili, veicoli commerciali leggeri, mezzi agricoli e industriali, presenterà nella 27esima edizione diAutopromotec. Il tutto con la doppia mission di avere un’utile occasione di confronto con la propria clientela, lavorando parallelamente a nuoverelazioni di business e a nuovi contatti funzionali ad allargare la propria rete vendita. Sunday April 14 2017 in Copertino (LE) we all enjoyed so much during the SALENTO CROSS CHALLENGE 2017 attended by numerous "crossers" from all over Salento and beyond. Really a nice day spent with fun and competition, multiple categories and ages in comparison, a fun and colorful paddock, so many people, music and fun... see you the next. "For the seventh consecutive year, the record of attendance has been achieved 450. It is a round number, it seems fake but I assure you it is absolutely correct ... I think it was perhaps - until now - the best night, not just for the records of attendance, but also for your fundamental contribution, for the great work of my co-workers, for the right mix of food and the exposed content." We are waiting for you in Bologna from 24 to 28 May at the 27th International Biennial of Equipment and Aftermarket Automotive. Expected figures for the Autopromotec 2017 edition are to be over 100.000 visitors and 120 institutional buyers from over 30 countries. Obviously also TECNECO will be present, we are at Pavilion 18 Stand 16. Lorenzo THE KART KID is only 8 years old and an innate talent for speed, competing in the Italian Karting Championship and when is in his kart is a true force of nature. TECNECO is delighted to be able to help him realize his dream, become a great champion one day, we will keep you informed. 2017 Filtration Kit Program, with 100 kits. Each kit includes the 4 grouped filters per application, each supplied in its single box, plus a box kit and label with kit codes and applications. On 21, 22 and 23 April we have had in visit our customer R.P.M. RICAMBI Srl of Porto Manovano (MN) and Desenzano del Garda (BS), who visited our production plants in Collepasso (LE), along with many of its Customers. Together with our guests we spent three very busy days of training and fun around Salento. Hello to everyone, hereby inform you that our e-commerce is officially active, through which all of our customers can have real-time technical and commercial information on our products and order them directly. E-commerce available only for Italian market. March 23 2017 we were guests of EMPORIO RIMINUCCI Fano (AN), a new TECNECO dealer, associated ASSORICAMBI, with whom we have organized an interesting technical focus. The event was attended 40 workshops, which we have told about TECNECO and its products. It been a wonderful evening, well organized thanks to the support of Luana, Giovanna, Marco and Alvaro, thanks again and see you soon. WE HAVE A NEW LOGO... WHAT DO YOU THINK? Also this year TECNECO took part in the event AUTOMILOVANOVICH HOME FAIR 2017 held in Banja Luka, capital of Bosnia 3 to 4 March. The event was a real success, it was born four years ago from the idea of Dejan and Mirjana Milovanovich, as a small fair between suppliers and end users, today this event has become a real reference point for the Automotive Aftermarket throughout Bosnia and beyond. We participated at the event with a booth dedicated and we've all faced directly with the many customers who came to visit us, interested in our products and the many news we have presented in this occasion. Between Friday and Saturday 17/18 March 2017 our Sales Manager for the Piemonte Region, Roberto Minardi, cames to visit our factories, in Collepasso (LE), along with a delegation of 5 Piemonte Customers. The partnership with Roberto is recent and with this long weekend we have had the pleasure to show our company to new customers, who have just started working with us, giving us confidence. Of course, the weekend was not just working, but also fun and relax around the Salento, Gallipoli and Lecce in particular. It was a great experience that surely will repeat again. TECNECO is proud to sponsor Michele Malerba Salento Swimming Champion! Born in 1991, affiliated to F.I.N. for society ANIENE Rowing Club of Rome, the most important Italian Society, Michele was in Marseille for a few tests and is now back in Rome to finalize the work done in these months and then deal with the Italian championship in the absolute best condition. 4 and 5 March 2017 Banja Luka in Bosnia with a TECNECO stand in support of our official importer AUTOMILOVANOVICH at the 4th edition of the HOME FAIR. On 24 March we participated with pleasure at the event organized by ASSORICAMBI in Bologna. For us an important opportunity to know the Associates of this important Consortium, after our entry as official supplier on September of the last year. For 2017 new projects renew a decades-long collaboration with one of the symbols of Made in Italy motorsport. For many years we cooperate with all the PIAGGIO Group (Piaggio, Aprilia, Moto Guzzi, Gilera, Vespa), developing and producing for the well known Italian brand, air filters, oil filters and fuel filters for scooters, motorbikes, thre and four wheels light commercial vehicles. TALKING ABOUT US "IN 2016 SPARE-PARTS WON"
How was your 2016? 2016 was a good year with a double-digit increase in turnover. We entered TECDOC, we have developed 150 new part numbers. And we also enjoyed at the TECNECO KART RACE last July with over 100 participants including spare parts dealers and mechanics, we hosted four customers in the company for a total of 50 visitors including spare parts dealers and mechanics. Plans for next year? There are several in the pipeline. These include e-commerce BtoB activation, the inclusion of antibacterial cabin air filter range and strengthening of the family of filters for Asian applications. TECNECO wishes you a Merry Christmas and a Happy New Year. TALKING ABOUT US "VINTAGE FILTRATION"
Passion for classic cars has no age. Tecneco, backed by over 40 years of experience in designing, manufacturing and marketing of air filters, oil filters, fuel filters and cabin filters for cars, launches "Vintage Filtration". Today we are pleased to present an interesting and appetizing opportunities, that we believe will make you happy. www.laterradipuglia.it web site, dedicated to the online sales of Apulian typical food products. But it is not enough, we are now close to Christmas and want make you a gift, TECNECO offers 10% discount if you proceed with a minimum purchase of € 40.00 tax included within December 16. VINTAGE FILTRATION, a new product/service TECNECO at your disposal. Passion for cars is at the base of our work, so we decided to support all our friends who, like us, live every day the magic of MotorSport. With Vintage Filtration program we open our "historical archive", a range of filters for applications on old, vintage, classic, cars... call theme as you want but they make you dream. Vintage Filtration not only offers a product but all our experience, gained over 50 years of activity in filtration. "So do not worry if your filter is not in range, just ask us and we will manufacture it especially for you." 24-25-26 November 2016, three days of training, study and lots of fun together with friends from DEAR SRL ORIO AL SERIO (BG), came to visit TECNECO plants with 15 of their customers, visiting also the beautiful city of Gallipoli and Lecce. TALKING ABOUT US "NEW CORPORATE VIDEO"
"Four million filters per year, 2 production plants, an international business presence in 40 countries around the world. These are the Tecneco numbers." In this way begins an interesting article about us and our last corporate video WE ARE TECNECO, published on the specialized web portal INFORICAMBI that we like to share with you. 18-19 November 2016, together with our friends from RICAUTO Concordia Sagittaria (VE), around Salento, with a short stop at TECNECO plants. Today we are pleased to share with you a short video, we enter into our manufacturing facilities, to show you who we are and what we do every day. We hope it is interesting for you. David's trip ended, 28.159 km on a Vespa, from Salento up in Iceland, rising from Scandinavia, North Cape and the Baltic countries. Thanks David for letting us share in your project. 18 and 19 October 2016, here is a small photo report of two interesting techniques evenings held at RICAUTO/Concordia Sagittaria (VE) and AUTOFORNITURE SILVESTRI/Forlì (FC). As always on these occasions, we thank our two official dealers for the impeccable organization and especially our friends MECHANICAL for participation and sympathy. Since 16/09/2016 TECNECO is oficially in TecDoc, one of the most important and worldeide car components database. We are sure that this new step will rapresent an important commercial improvment for all of us. Even this year we've been in Frankfurt at AUTOMECHANIKA, one of the most important automotive component's international fair. It was a pleasure have had you as guests at our booth, HALL 5.1 - STAND A80, an spent together short moment of work and fun. TECNECO GT-SPORT Fair Challange began with a great success, a real challange amoung the guest of our stand who competed with GranTurismo cars thanks to a PS4 always available and super busy. Thanks again to all, see you at the next AUTOPROMOTEC 2017 trade fair in Bologna May 24 to 28 next, where TECNECO GT-SPORT Fair Challenge will continue to enjoi all of us. Here you have the direct link to a nice article posted on the specialized Portuguese portal POSVENDA.PT which title is "NOVOS ARTIGOS TECNECO FILTERS". Since many years we distribute our filters in Portugal together with our official distributor AUTOSILVA. Was been an interesting experience at fair MIMS AUTOMECHANIKA 2016 in Moscow 22-25 Ougust. Where together with SWISSVERT our trade partner for Eastern Europe markets, we spent 4 days full of interesting meetings with leading companies specializing in spare parts distribution, laying the fondation for important business developments in those areas. HYPERBOREA2 & TECNECO, this is the link to a nice interview to davide at the Danish TV2NORD. We contributed with pleasure to the awareness campaign on children road safety, held in BanjaLuka Bosnia, by our official partner AutoMilovanovic, really a good initiative...well done. Here you have the direct link to a nice article posted on the specialized portal INFORICAMBI which title is "IL RICAMBISTA? PER TECNECO UN PARTNER". Have a good reading even if the article is in Italian language. Available mobile version of TECNECO on-line catalogue, with all the search features of the desktop version but adapted for smartphone and tablet use. Available 5 types of research; TECNECO code, original/competitors code, vehicle plus information about all the new items developed in the last three years and highlights of the lates updates. Also available technical sheets, actual product image, mounting boards and commercial information on each code. Below you can download a little gift to SALENTO, an amazing place where spent your holidays. A beautiful day together with our friends from Puglia, Basilicata and Calabria. An Important opportunity to share experiences, ideas, future and to show to our customers factories, production technology, research, products quality. And then all together at LA CONCA International Kart Circuit in Muro Leccese, where 80 of our friends take part at the firts TECNECO KART RACE, a really competition with worm-up, qualifying, pre-finals and gran final with 1st, 2nd and 3rd place. Available TECNECO 2016 FILTRATION KIT CATALOGUE with 315 Kit codes. Hyperbòrea 2, trip continues one year after the firts Davide's adventure from Salento to North Cape on a Vespa. This time are 15.000 km, always on a Vespa, from Riga to Iceland. We are ready to follow Davide, do it with us. - CABIN AIR FILTERS CATALOGUE 2016/17, with 357 product codes. - DISPLAY to issue quality and usefulness of TECNECO cabin air filters. Two days in Salento organized together with our friends from EUROCAR/Legnago (Verona), visiting our production facilities. Training, sharing, exchange of ideas and professional growth. But not only work, also relaxation and entertainment around Salento, a magic land to discover. Thanks to our frinds from EUROCAR and see you on the next TECNECO event. 3 days of the event organized in collaboration with FIRAT AUTORICAMBI/Gianico (Brescia), which led visiting our factories in Collepasso (Lecce) with 15 customers to show our production processes and closely observe TECNECO quality standards. In addition this was a great opportunity to show to our friends Salento our land. Since April 2016 TECNECO introduced an important technical improvment during eco oil filters production. Read the Newsletter. Thursday April 14 2016, TECNECO focus at D.R. Autoricambi Srl/Cittadella (PD). Thanks to everyone, we spend a nice evening together and see you omn the next one. From the month of April 2016 TECNECO promotes the adv campaign TECNECO WARRANTY SIMPLE, IMMEDIATE, SAFE focused on our product warranty policy. WARRANTY SIMPLE, IMMEDIATE, SAFE means that any damage caused by a defect or malfunction of a TECNECO filter will be refunded immediately, once confirmed the direct responsability of the filter. Almost a year after the adventure of Davide Leopizzi still makes us all dream. It was the afternoon of Friday, April 17 2015, when Davide riding his Vespa PX125 1982, set off for an adventurous journey that would take him from the Cape of Leuca up to North Cape, ending in Riga in Latvia. We followed Davide step by step and today we like to remember his adventure with this photo. Great Davide. Active now new TELEPHONE AND WHATSAPP TECHNICAL SUPPORT SERVICE, available from Monday to Friday, from 08 am to 06 pm. One of our experts at your disposal to reply, in real time, to any technical questions regarding any products of TECNECO filtration program. Here are a few clicks directly from AUTOMILOVANOVIC 3rd HOME FAIR 2016, held on 27-28 February 2016 in Banja Luka in Bosnia and Herzegovina. Available since 18/02/2016 TECNECO Methane Gas filters range, 4 polyammid-glassfiber filters cartidge with applications on FIAT Group cars equipped with methane system at origin. An interesting news for all our customers who purchase and market TECNECO FILTRATION KIT, available a new "S" series Kit Box with automatic opening and closing, new graphics and dimensions 34,5 x 18,5 x 19 cm. Here are some photos shooted last night during an important quality audit at our oil and fuel filters production plant by an important European engine's manufacturer, which for obvious confidential reasons we can not tell you the name...is a pitty because you'd be all pleasantly impressed, but unfortunately it is so. 27-28 Feb 2016 - Banja Luka - Bosnia and Herzegovina. We will be present at the 3rd edition of "Homefair" organized by our partner in Bosnia and Herzegovina AUTOMILOVANOVIC. An excellent opportunity to learn about the market and customers in a professional and funniest setting... we will keep you informed along the way with new updates and posts. First technical focus with friend from NUOVA AUTORICAMBI Malcontenta Venice, thanks to Daniele, Luca and all participants active and interested as ever... see you to the next. 3A and 3B Class from Collepasso Comprehensive School visit TECNECO as part of the activities organized by the school to guide children in the school and professional future. Is not just a pleasure but also an honor to be welkomed in the best way when you visit a customer, especially if we are talking about one of the most important spareparts distributor in Portugal, AUTOSILVA SA in Porto and Lisbon. A long time partnership betwen TECNECO and AUTOSILVA which this year celebrate 10 years and that is renewed for the future. "Alone we go fast, together we go forward." In this way this year we want to wish everyone a Merry Christmas, from all of us of TECNECO, a fantastic group of people that fully understood the importance and strenght to be a team. Another interesting event in South of Italy this time, with the friends from MA MEDURI from Pellaro (RC) and 40 technicians repair, all very interested and participative. Great Marco, 2th classified at SALENTO CHALLENGE RACE 2015 at PISTA SALENTINA in Ugento (LE), famous international karting track. Really a nice placement for the young Salentinian driver, we are sure will hear about. Thanks to Fabio, Marco and all the friends from Emporio della Batteria from Modena for the nice evening spent together with theyr customers repairers, wihch we thank for the presence, attention and partecipation... see you the next. 29/11/2015, another nice evening of deep techincal focus with FIRAT AUTORICAMBI/Gianico (BS), organized in a perfect way by Luigi e Matteo Gritti and with the partecipation of 40 car repaires. An excellen opportunity to compare and analize, helpful to improve and understand more deeply the needs of the market, both from a technical and commercial side. 28/11/2015, an interesting Technic Focus in partnership with our customers and friends from S.A.R.A. Autoricambi/Carrè (VI), more than 60 car repairers present who interacted with interest with our men present. Thanks for the excellent organization and once again for the partecipation of all. Starting from October 2015 an important technical improvment has been made on air filter AR10234-10PM-J for NISSAN applications. The improvement consist in the replacement of material used for the ralization of the two filters sides profiles, priviously polimeric, now alloy aluminium. This important structural improvement makes this filter strenght respect the previous version. 18-20 September 2015, three days of relax and fun at Valtur Club Favignana in Sicily, all organized by Domenico Blandina and offered to our best customers. Thanks Domenico and thanks to all partecipants, see you the next. Thanks to Filippo and all the friends who attend the technic focus on Wednsday 16/09/15. A nice evening of discussion and sharing of technical aspects and more, thanks again and see you the next one. A journey long four mounths, more than 13.000 km on a Piaggio Vespa 125, this is Davide Leopizzi's adventure, alone from Salento (SouthItaly) to NorthKape. In a nice interview Davide tells us briefly his adventure and makes us dream a little too. Video: TECNECO manufacturing "when technology helps us"
What happens when passion and experience come together with technology and automotion...the result is something pleasent to see, to hear, to touch...a good product with the right value. Look the video "TECNECO MANUFACTURING"
Look more videos "TECNECO CORPORATE VIDEO"
The qality of a product depends by continuous tests and a good laboratory helps you to make it better. Hundreds of tests every year on materilas, components and products. This makes the difference. In TECNECO, since many time, we are equipped with our own internal laboratory, where we perform some of the most important tests to ensure quality ed efficiency of each filter manufactured. Some of the most important tests performed are chimical/mechanical tests on the elastomers (rubber gasket and o-rings), hardness tests on metals, spin-on and eco oil filters operation simulations, performed on pulse oil pressure and burst test benches. Also we cooperate with an Indipendent Laboratory in Torino, colled TEXA that performs structural and performance tests on all the automotive components, filters icluded. In partnership with TEXA we perform performance tests according to ISO5011:2000. We are working on with the installation of a 200 KW photovoltaic system on the roof of our oil and fuel filters production plant. Sonn we will be enery independent and contribuete in our small way to reduce pollutants emmissions in the atmpsphere. Available the new fuel filter GS8029/1 which replaces the previous GS8029 re-called for structural problems on 18/02/15 Ref.0057/15. Today we start the installation of a 200 KW photovoltaic system to make energy-independent our oil filters and fuel filters production plant. Exciting weekend in Ascoli Piceno, after his second place in the first session on Saturday, just two seconds from the first, a spectacular crash stops Max, but fortunately no consequence to him. Amazing Davide Leopizzi, after weeks traveling in Vespa finally arrived in Nordkapp, a wonderful adventure that will crown a great achievement but that does not end yet, see you soon Davide let us still dream. 17-18-19 June 2015, again around Italy to present our story, our products and our project, together with our friends and partners of R.P.M./Mantova-Desenzano, LupatiniRicambi/Orzinuovi-Brescia, FinatoRicambi/Torri di Qartesolo-Vicenza. Thousands of kilometers, from Salento-South Italy to North Cape, a not common courage and determination for a not common guy... great DAVIDE LEOPIZZI. In the photos at the PIAGGIO MUSEUM in Pontedera and then far away already in NORWAY. Once more thanks for the amazing partecipation, has been a fantastic and interesting experience, see you next. Thanks to our friends of BM Ricambi, that given us possibility to spent a nice evening of technical focus with guys of Gruppo BM (BM Ricambi, Ricauto, RAL, Salmaso), at theyr Quinto di Treviso (TV) headquarter. An amazing opportunity of technical comparison, to discuss about our products, and reply to many interesting questions. New 2015 Europe Kit Filtration catalogue, with new Kit #4 filters (Air, Oil, Fuel, Cabin) with applications on European cars. New 2015 Asia Kit Filtration catalogue, with new Kit #4 filters (Air, Oil, Fuel, Cabin) with applications on Asian cars. Davide and his Vespa cross the border, they are in Austria and no one can stop them anymore. Many thanks to our partner in South Africa WORLDS SPARES, who partecipated to AUTOMECHANIKA JOHANNESBURG from 6th to 9th May 2015, also featuring TECNECO. After almoust two weeks of trip Davide's adventure goes on, he already arrived in Toscana and soon Florence and than Pontedera Piaggio's home. After one week our friend Davide traveled 700 km, which can seem few but not riding a Vespa. From Leuca (Salento) to Montecosaro (Marche) and then Perugia, Florence and Pontedera home of Piaggio. Thanks to our friends of DEAR Srl for the intersting evening of technical focus on 16/04/15, an axcellent opportunity to deepen technical aspects, important to know and disclose. In the afternoon of Friday April 17, Davide Leopizzi mount riding his Vespa PX125 1982, for an adventurous journey that will take him from Cape of Leuca in Salento to North Cape and ending in Riga Latvia. We will be happy to follow Davide step by step and share with him his adventures. Tecneco changes its packaging, starting from May 2015 the new box concept with new colors Yellow/Black will gradually replace the current one with colors Yellow/Green. Thanks to our friends from Automec who offer us a nice evening with technical insight, dialogue and fun and thanks to all the partecipants. Even this year thanks to all Automilovanovic staff, for the support and kindness during the second edition of Home Fair in Banja Luka. Thanks to all, even this time we succeeded, ISO 9001:08 Quality Certification renewed with TUV-SUD. Three interesting days between Hungary, Poland and Lithuania, visiting three of our most important distributors in East Europe. Thanks to aur friends of AutoHit, for the important cooperation that since 2002 allow us to be widely present throughout Bulgaria. Automechanika Frankfurt, one of the most important trade fair in the world for the Automotive sector. Also this year we'd been, thanks to all the friends whom we shared once again this important experience. Thanks to all the friends who come to visit us in Dubai, hot, so many people, amazing experience, see you to the next one. Since 2014 TECNECO has a new partner for distribution of our products throughout the Greek market, Eltrekka A.E. a major distributor with a national distribution center in Athens and locations throughout Greece. Since 2011 our filters are distributed in South Africa thanks to the precious cooperation with WorldSpares/Johannesburg.